molly swoons: OVER THE WEEKEND + HELLO 25! OVER THE WEEKEND + HELLO 25! The first photographic evidence that I am 25. My birthday was very wonderful and low-key. Greg made me breakfast Friday morning and was like "Marathon Scandal, you know you want to" and I was like SAY NO MORE. Then after a few glorious hours of lounging and Olivia Pope, we went to the Apple Pan and grabbed me some birthday burger. It was delicious and came out shockingly fast. I don't know how may more times we'll go there only because it's on the west side and we're east siders (I knew that would become my truth once I moved to LA). 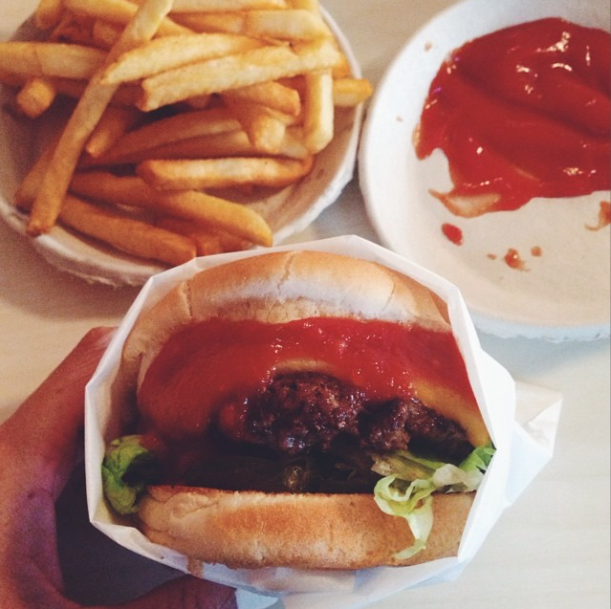 So if you know of any great burgers on the east side - hook a girl up. After burgers went to Disneyland to watch the fireworks! Which I know - sounds slightly like crowding suicide but it actually wasn't too bad. Also I hope to one day be able to work a baseball cap like my mama. Maybe 25 will be the year of the cap. Or maybe I should just accept that I have a large head and move on. Strawberry belts at the Farmer's Market. Not from my birthday, but still important I think. It's a universal love. The rest of the weekend consisted of trying diligently to finish my birthday cake (because it's from SusieCakes and they are AMAZING and the nearest location is in Brentwood and getting it involves a 90-minute drive round trip, but it is a religious experience). And watching The Sopranos. But yes, 25. I'm exactly where I'm supposed to be. It feels really good.